All transactions are safe and secure with a reliable history in online purchasing behind each of our associates. 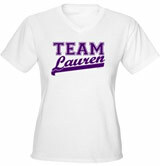 Buy the Team Lauren t-shirt to own Hills clothing and merchandise. Let everyone know that you're on Lauren Conrad's side with this Team Lauren MTV Hills t-shirt. The feud began when Heidi Montag decided to move in with her boyfriend Spencer Pratt, after previously ending the relationship due to his unfaithfulness. Upset by Heidi's potentially disastrous decision, Lauren turned to Audrina Patridge for friendship, eventually inviting Audrina to move in with her. In addition to the Team Lauren tee above, browse the Hills Clothing Gallery for more apparel like men's and women's clothes, kids shirts or hoodies.